A Chinese construction tycoon has emerged as a possible saviour for cash-strapped Leeds United Football Club, Chinese newspapers have reported. Xu Ming, founder of Shide Group and chairman of China's top football team, is reportedly in talks about investing in Leeds Utd. 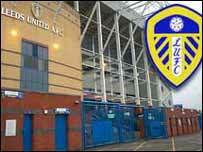 Leeds Utd chairman Professor John McKenzie said on Monday that he was stepping down to hunt for investors. Professor McKenzie has business links in East Asia. Professor McKenzie said then that he wanted to avoid any potential conflict of interest that might arise if he remained as chairman as he believed strongly that the club needed new investors. Mr Xu, 32, has created a $360m (£205m) building materials fortune in the construction boom spawned by China's roaring economic growth. US business magazine Forbes ranked him as China's 11th richest tycoon in its November 2003 rich list. Football-crazy Mr Xu's company - Shide Group conglomerate - owns its local team, Dalian Shide, which is also China's best. Dalian Shide has won China's national championship seven times - more than any other club - had four 2002 World Cup players and was home to Sun Jihai before selling the defender to Manchester City. Mr Xu founded Shide Group in 1992 as an earthmoving and construction company. It rapidly moved into manufacturing PVC window frames, then petrochemicals, cars and household appliances. His passion for Premier League football was clear when he hugged Bobby Charlton on the pitch during a visit to Newcastle United as a guest of the club's chairman, Freddy Shepherd, last April. Media-shy Mr Xu seldom gives interviews. But he explains his business philosophy on his company's website: "I think everything is an opportunity....the real challenge for all of us is how to grab them in a timely manner." He lists Microsoft founder Bill Gates among his heroes. Success comes from having a plan and following it "persistently and naturally", he says. He reads widely and thinks successful people need broad interests. Shide Group, which is listed on the Shanghai Stock Exchange, has deep pockets. Sales topped $460m (£261m) in 2001. Leeds Utd's board has until 19 January to find a way to pay-off its £82m debts. It has acknowledged it is in talks with potential buyers without giving details. Allan Leighton also recently resigned from the Leeds board and is thought to be putting together a consortium of investors. Other potential buyers are thought to include a group of Middle Eastern investors led by a member of Bahrain's Royal family, Sheikh Abdul Rahman bin Mubarak al-Khalifa. Premier League matches are hugely popular in China, so links with a top team could be a cost-effective route to nationwide advertising.